PRAISE FOR "WALKING WITH THE WIND "
"The definitive account of the civil rights movement. ..a compelling history that promises to become a sensation. ..It is impossible to read this inspirational and hideous story of courage and cruelty without being moved. ..If there is one thing this splendid, pulsing book is saying, it is that anything is possible if you insist." "A book of shrewd assessments. ...Lewis is living proof that one can be uncompromising without being unforgiving." "An astute first-hand account of events that could be supplied only by a key player, destined to become [a] classic in civil rights literature." "Powerful...probing...full of dramatic stories, enriched with details that reflect Lewis's own perspective as a participant-observer." 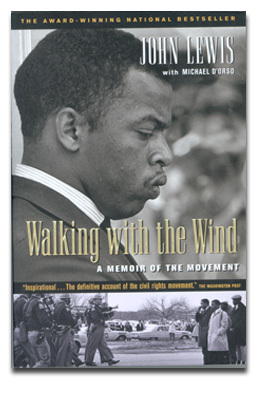 "Walking With the Wind is without a doubt the best 'movement' autobiography yet published." "A simple, fascinating chronicle of the South's modern freedom movement and its aftermath -- a wise, moving and personal account that stirs with unusual honesty and directness." "Beautifully restrained, yet powerful. ..uplifting...a must -read for anyone who wants an inside look to comprehend the civil rights movement of the 1960s." "A gritty, gripping memoir. ..a remarkable story. ..evocative and vividly personal." "Powerful. ..a moving tale. ..deftly conveys the drama and the danger of those days." "A stirring portrait of the power of moral consistency and courage." "Superbly written, with Lewis's searing honesty showing through." "Stirring...inspirational...passionate...profound...this memoir is rich indeed." "A fascinating personal history that gives as much insight into the civil rights movement and its political sequel as any book I know." "Highly compelling. ..epic...his authority rests in his authenticity." "What is freshest about Walking With the Wind is that Lewis is...candid about the class conflicts that afflicted the modern civil rights movement from the very beginning. Tensions between the uneducated rural poor and the urban intellectuals were glaringly obvious to African-Americans, but largely invisible to the white press and the historians who succeeded them." "Walking With the Wind should be an inspiration for any of today's youth who feel as if society is short-changing them." "Vivid. ..powerful...a thoughtful, illuminating 'insider' history of the movement and its aftermath." "Moving. ..can be read not only for its insights into the movement, but for its insights into the human spirit." "Poignant ...smoothly-written, well-organized ...keeps a voluminous cast of characters orderly while illuminating the period's often-obscure internecine spats." "This dramatic autobiography doubles as a primer on the l960s civil rights movement." "An amazing story. ..John Lewis is an American hero, an American treasure and a 'living saint." "Captures the man and the movement with honesty and dignity." "Distinguished by its honesty and insight, Walking With the Wind inspires even as it acknowledges the road yet to be trod." "He may be a saint, but Lewis has the deadly aim of a true revolutionary. Walking With the Wind should electrify anyone who believes that society needs change." "A passionate, principled and absorbing first-person account of the civil-rights movement -- dramatic, well-paced history fired by moral purpose and backed by the authority of hard times in the trenches. ..a classic, invaluable blockbuster history of the civil rights movement." "Vivid and personal. ..a uniquely well-told testimony by an eyewitness." "Thrilling. A civil rights hero's fiercely honest look at himself and the nation. ..one of the great memoirs of black movement history." "Recommended for the civil rights collections of all public and academic libraries." "Insightful and unexpected. ..Here are the inner struggles of key figures in the civil rights movement, the doubts and fears, the rivalries and jealousies -- all there in living color. ..It is Lewis's keen eye for details -- a memory that latches onto the minutiae, building up a compelling body of evidence in a trial of a nation's thoughts and feelings --that makes Walking With the Wind so compelling." "No other elected official in America embodies the grand legacy of Martin Luther King Jr. more than John Lewis. In other words, he is a national treasure. Read this book and see why."